Tiddly Oggie is Cornish for 'proper pasty' and that's exactly what this is, made with hormone free beef, onion, carrot, potato. 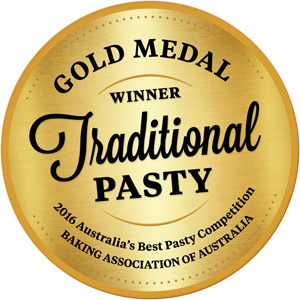 Ferguson Plarre Bakehouses have been baking award-winning Tiddly Oggies for over 115 years! 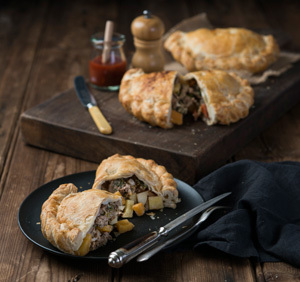 The wholesome meat & vegetable filling found inside every pasty makes an excellent alternative to the classic meat pie. We are proud to have the Tiddly Oggie as one of our most popular products and invite you to come and try one for lunch, or as a take away snack. What is a Tiddly Oggie? In Cornwall, a pasty is often called an “Oggie”, and while it is unclear as to where the word originated, some people have suggested that it is derived from hoggan, a kind of bag in which the miners carried their croust (croust is the Cornish term for lunch). Whilst you were down in the mines, you worked hard until you got starving hungry. That was croust-time. "Croust time" was really "lunch time" but the actual time varied. The reason for this was that down in the tin mine, you couldn't see the sun so you didn't know the time at all. Up top, out of the mine, posh people in Cornwall call it "dinner time" and croust-time for them is in the middle of the morning still. When you worked down in a mine, you couldn't carry two or three meals with you, which is where the Tiddly Oggie came into its own. After "croust", the miners worked until they were starving again and that was how they knew it was tea-time, based on their hunger levels, then you went home for your "tea". The Cornish miners’ wives developed a simple pastry-cladded envelope, which kept the food warm and free of dust while their husbands worked in the mines. The portability of the pasty not only made it easy to carry, but if it should get cold it would be relatively easy to heat up. This was done by putting the pasty on a shovel and holding it over a head-lamp candle. Miners never ate a pasty with a fork, they ate it end to end, and held it upright to keep the juices in. Since entire Cornish families worked in mines and each member of the family wanted different ingredients in the pasty, the Cornish wife would make sure each pasty had its own distinguishing feature. 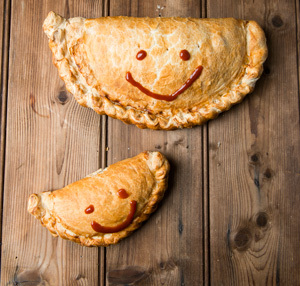 According to the Cornish Recipes Ancient and Modern, "The true Cornish way to eat a pasty is to hold it in the hand, and begin to bite it from the opposite end to the initial, so that, should any of it be uneaten, it may be consumed later by its rightful owner. And woe betide anyone who take's another person's corner!" The pasty became particularly popular in Devonport and Plymouth, where sailors called them “tiddly oggies” (also referred to as Tiddy Oggies or a Tiddy Oggy). 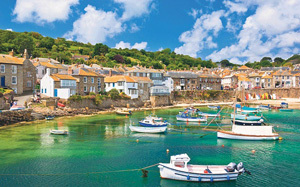 Tiddly in naval slang means ‘proper’, a common adjective and adverb used by Cornish people, and oggie was the term for a pastie in cornwall, so “tiddly oggie” meant proper pasty. Cornish rugby supporters later adopted the chant “Oggie, oggie, oggie, oi, oi, oi!” when cheering on their team. Many people believe this is the origin of the great Aussie chant “Aussie, Aussie, Aussie, oi, oi, oi!” Well, we do love our pies and pasty's. Deep underground in the mines, there were all kinds of sounds, and the miners sensed the presence of “the little men”. Legend has it that after the contents of the oggie had been eaten, one corner of the pastry, where the miners initials were placed, would be left on the floor of the mine for these “Knockers” or ‘Knackers’ as they were called. The miners had little enough to give, and this offering was considered enough to satisfy the mischievous imps who were renowned for taking offence if slighted, but could be helpful if placated. Eighteenth century accounts from up-county travellers to Cornwall tell of labourers bringing up their families on a diet of vegetables baked in a barley dough. In 1867 a West Briton report told of the subsistence level and revealed their great dependence on flour. Many of these early writers expressed surprise that both children and adults looked reasonably well nourished on what they considered a very poor diet. 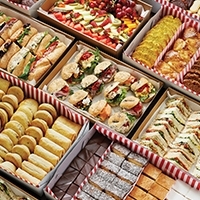 It was, of course, what we now know as a low-fat diet. 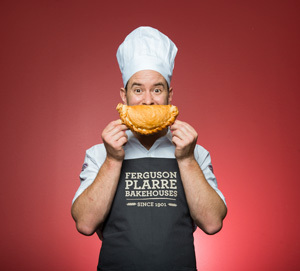 Ferguson Plarre Bakehouses have been baking award-winning Tiddly Oggies for over 115 years! Their wholesome meat & vegetable filling make an excellent alternative to the classic meat pie. We are proud to have the Tiddly Oggie as one of our most popular products and invite you to come and try our signature Original Tiddly Oggies and the newest addition to the range, our Jumbo Tiddly Oggies! Each of our Jumbo Tiddly Oggies are packed with delicious local ingredients, made by our local bakers and made the good ol’ fashioned way… with plenty of love - It's a 'proper' pasty!